Bollenberg is located on a ridge, connecting Westhalten and Orschwihr. This lieu-dit gives rich wines with obvious varietal character, charm and class and the growers match the many micro-climates with each grape. 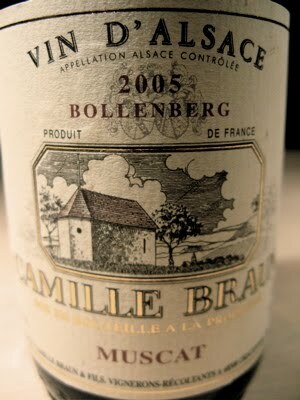 Nevertheless, the prices of the Bollenberg are so low that one becomes embarrassed. 2005 Muscat Bollenberg is a pure Muscat Ottonnel. The aroma is not only peach lade, but does also offer honey, licorice and the delightful fruitiness that is a hall-mark of Muscat. The taste is compact and medium bodied, with splendid acidity and the hint of bitterness that goes so well with asparagus. A real treat! Price: € 6.00.